In this episode you’ll read about how we built our yurt. If you want a yurt you have a few options: have one made in Mongolia, have someone local make it, or you can build it yourself. We did the latter and we’ve enjoyed the process a lot. First of all because we learned a ton, second because we found we work together really well, and third because ‘YAY we’re building our home!!’ . Rather than give you an account of our day by day process, I’ll go more into the experience than the technical stuff. You can check our Facebook if you want more details. 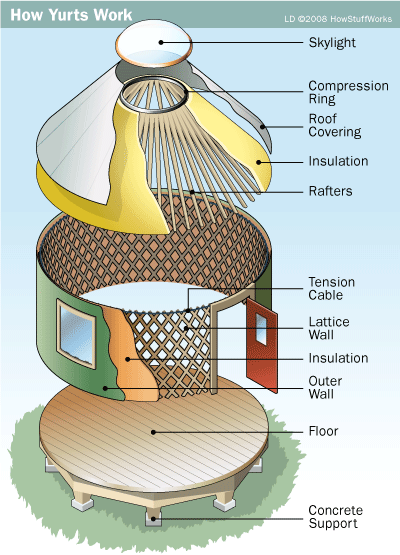 For some background, let’s start with this cool infographic that shows the layers of a yurt. Not shown here is the interior canvas that goes between wall and insulation. Source. From the inside outwards, a yurt has four different layers. First comes the wooden frame: walls, poles and a crown. You can see this layer when it’s finished and mounted. When we started the wood was just cut, all the shaping and piecing together was done by us. The second layer is the interior canvas, that covers walls and roof. After that you have the insulation, usually made of a natural material like sheeps’ wool or flax. Finally there’s the outer canvas, one that is heavy and waterproof. To me it’s still amazing that you can make a solid and well insulated structure with just these materials. It’s only logical when you consider the origins though: the Mongolians have used and perfected yurts since 400 B.C. The yurt workshop, also a yurt. Assembling the walls. 732 knots to be made! The wooden frame is what we started with. We quickly discovered that we both had a preference for different types of work. Stef was more into the cutting, planing and sanding process. He enjoys creating something and then giving it a perfect finish. I on the other hand would be bored out of my mind if I had to sand the million pieces that were to become the walls. What I did enjoy was piecing the walls together. This was done by a little routine and a clever tool that enables you to make tight knots. Then came the roof poles: some more cutting, planing, sanding and drilling. You attach these to the top of the wall and stick the other end in the crown. The round shape makes sure that the weight of the wool and fabrics is evenly divided between the poles and walls. The shape combined with the weight is what makes it such a strong structure. Getting buried in 30m2 of fabric while attempting flat felled seams. Next was the interior canvas. I sourced it myself and found it at Rijstextiles; a heavyweight unbleached cotton at 3m wide. Perfect, because that meant less seams to sew. There’s almost 100 m2 of fabric in there, can you believe it? I sewed all this on my own machine, making flat felled seams throughout. The yurt builders don’t bother with them because you won’t see the unfinished seams, but I just had to do it. For strength, but also the idea of unfinished seams made me uncomfortable even though they wouldn’t be visible. So I guess it’s not that I don’t like finishing things in a nice way, it apparently depends on what I’m working with. The next layer we actually did at home because there wasn’t enough time. We were working under a time restraint so we had to do the most important things first. The sheeps’ wool for insulation is 10cm (4″) thick. It still has this wonderful sheep smell and its very soft. Just gorgeous stuff. It comes from different flocks, herded in the middle of France. It’s also what takes up the most space and it’s really heavy. I needed to hand sew big pieces together to create two roof pieces and two wall pieces. A loooot of podcasts went into this insulation. Sewing the roof in waterproof fabric. The roof sewn together and cut out. Sewing the outer canvas was also my job of course. This one I did on Juliens industrial Pfaff because it’s so heavy and you need a special flat felled seam guide. I’ll do a separate post on Mrs. Pfaff, she was amazing. It was a whole other experience, sewing these tough materials in such an enormous volume. At some points I needed all my strength to guide this stuff through the machine. An interesting observation: I thought sewing would go smoothly because I do it all the time. Funny enough this made me pay less attention and I had some trouble with the thread breaking and not threading the machine correctly. I felt a bit stupid and got more annoyed than when I would have been when learning a new skill. So there’s my lesson: don’t assume you know it all. Cutting wood with the scary circle cutter. I feel like I’ve strengthened my sewing with this project. I was happy to leave the woodwork mostly to Stef, I found I didn’t have enough energy to learn something completely new at this moment. For me it was perfect to use a skill I already had in a way I’d never used it before. Stef was happy to get away from website building for a bit and dive into carpenting completely. He liked it so much he might even continue with it. Putting up the frame for the first time. We've packed the yurt in our truck, and it fits! We’ve stayed with Julien and Emma for almost three weeks altogether. We just parked our truck next to their yurts and camped there. We worked every day, even through the weekends. It was great to be away from everything and just focus on this one thing. This great thing, turning wood and cloth into our home. We had so much fun doing it and we felt exhilarated with every piece that we finished. It made us more confident, showed us that we can learn these skills that are required. And that if we want to build our next home, we can learn those skills too. What is the last skill you’ve learned? Or the next skill you want to learn? Wow, you just did it! You are never too old to learn, that’s what I always say. Always stay curious to anything new in your life that you like to do. Every experience makes you feel more rich. Thanks for sharing yours. It would be great project to do with more people! And you don’t have to do it the official way, you can make one from scraps and pieces just for the summer. Wow. What an accomplishment! My recent accomplishment pales in comparison but I’m still pleased to have taken on knits after utter failure a few years back. It feels good to say, “I can do that” instead of cringing at the idea. Wij zijn toch wel onder de indruk van de foto’s van het bouwen van de yurt. Misschien mogen we een keer een kijkje nemen binnen. We zijn nog wel een aantal weken in de Morvan. I know that they will come in large rolls or pieces and have to be sewn together. Any advice on that? It would be helpful. Needle size, thread, hours doing it etc. Trying to do the cheapest thing we can, still with good quality. Following your work on here has been a pleasure and its something we relate too very much! SO MUCH WORK. Hi Meg! How Exciting that you’re almost done! We got our wool via the yurt builder, he has it specially made for yurts. It’s not felted, just an airy 10 cm (2.5″) thick wool “fabric”. It came on rolls of 10 m long and 1.8 m wide. That’s the same height as our walls. Our roof consists of two big overlapping half circles, one half with a ‘pie piece’ left out because the roof is at an angle so you don’t need a full circle. I spent a lot of time sewing the half circles, I think it was three full days in total. I sewed the pieces together with a blanket stitch, as seen in this post. That gives a kind of ridge on one side but makes sure there are no gaps. I used a 3″ sharp needle and a thin but strong thread. I also sewed handles at the top of the circles and walls with pieces of fabric. That way you can pull the pieces up on the roof and attach the wall pieces to the frame. Email me if you need more info. Good luck! This is completely fascinating. I came here via your Almada robe and now I can’t stop thinking about yurts! Could you offer to a guide to creating a budget for a project like this? Hi Lia! Well I was thinking about writing a guide at some point, but until then I can tell you what we paid for ours. We had three options: buy a traditional one, buy a modern one, or build a modern one under guidance. The first option is the cheapest, an imported yurt from Mongolia of 28m2 (our size) is around 5000 euro’s. But they are not adapted to wet climates and are low, with walls of 1.60m. A modern yurt is adapted to European climate and has higher walls, and uses local wood and insulation, and is around 6000-10.000 euro’s depending on where you buy it. The last option is what we did, and we paid 4700 for the materials and the hours we needed guidance. You’ll also need a platform to put it on, around 1000 when you buy one, we paid 700 for the one we built ourselves. The last cost is the stove, which is around 500 euros depending on what you put in. But it’s an essential part, unless you plan to only put it up in summer. Hope this helps!